A team at BESSY II has investigated how various iron-complex compounds process energy from incident light. They were able to show why certain compounds have the potential to convert light into electrical energy. The results are important for the development of organic solar cells. The study has now been published in the journal Physical Chemistry Chemical Physics. Transition-metal complexes have important properties: An element from the group of transition metals sits in the centre. The outer electrons of the transition-metal atom are located in cloverleaf-like extended d-orbitals that can be easily influenced by external excitation. Some transition-metal complexes act as catalysts to accelerate certain chemical reactions, and others can even convert sunlight into electricity. The well-known dye solar cell developed by Michael Graetzel (EPFL) in the 1990s is based on a ruthenium complex. However, it has not yet been possible to replace the rare and expensive transition metal ruthenium with a less expensive element, such as iron. This is notable, because the same number of electrons is found on extended outer d-orbitals of iron. However, excitation with light from the visible region does not release long-lived charge carriers in most of the iron complex compounds investigated so far. A team at BESSY II has now investigated this question in more detail. The group headed by Prof. Alexander Föhlisch has systematically irradiated iron-complex compounds in solution using soft X-ray light. They were able to measure how much energy of this light was absorbed by the molecules using a method called resonant inelastic X-ray scattering, or RIXS. They investigated complexes in which the iron atom was surrounded either by bipyridine molecules or cyan groups (CN), as well as mixed forms in which the iron centre is bound to one bipyridine and four cyan groups each. The team members worked in shifts for two weeks in order to obtain the necessary data. The measurements showed that the mixed forms, which had hardly been investigated so far, are particularly interesting: In the case in which iron is surrounded by three bipyridine molecules or six cyan groups (CN), optical excitation leads to only short-term release of charge carriers, or to none at all. The situation changes only once two of the cyano groups are replaced by a bipyridine molecule. 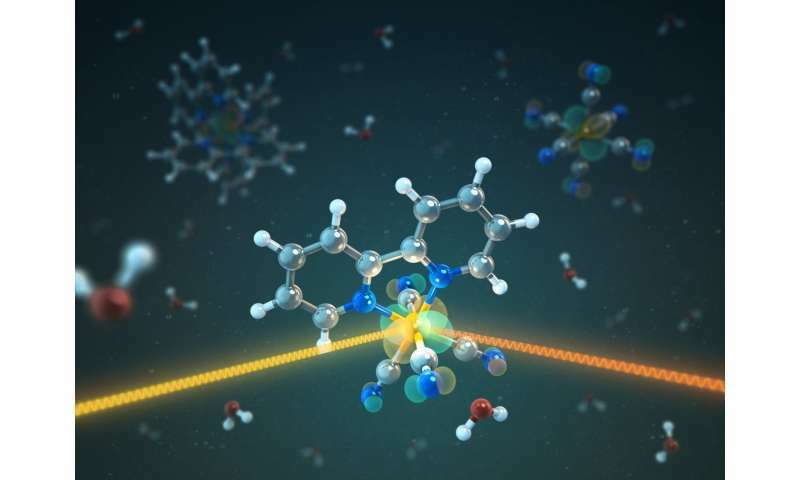 "Then we can see with the soft X-ray excitation how the iron 3d-orbitals delocalize onto the cyan groups, while at the same time the bipyridine molecule can take up the charge carrier," explains Raphael Jay, first author of the study and whose doctoral work is in this field. The results show that inexpensive transition-metal complexes could also be suitable for use in solar cells—if they are surrounded by suitable molecule groups. So there is still a rich field here for material development.